This rare Philco is known as the Jewel Box and the Pagoda. The cabinet makers used Aspen for the upper half, Birch for the base and Mexican Accra wood for the lower portion. I have also seen this model with Birdseye Maple on the lower half; I personally think the dark Accra wood is much more attractive. 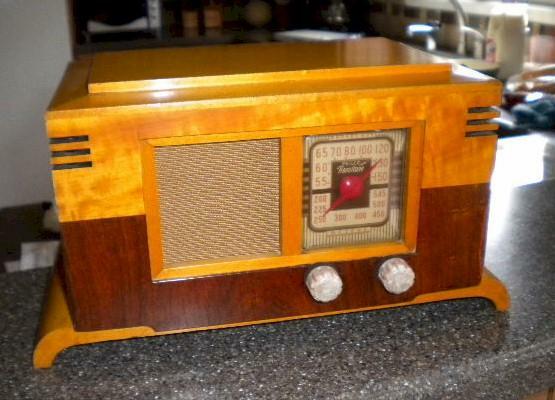 This particular radio has had an older electronics restoration and cabinet refinish; plays great across the AM dial with very good sensitivity and volume. Only 12,510 units were manufactured. 12-1/2"W x 6-1/2"H x 6-1/4"D.
You are visitor number 3,093 to this page.